Southeast University, a prestigious higher learning institution in East China's Jiangsu province, published its 10 science and technology issues in the provincial capital of Nanjing on Dec 27, 2018. Eyeing the frontiers of science and technology, the 10 issues include digital clones, 6G mobile networks, molecular ferroelectric materials, big data and legal tech, information meta-materials, internet-based network swarm intelligence, digital city planning, ultra-high energy efficiency design on high-end chips, precise construction of 2-dimensional materials, and intelligent control of integrated energy systems. Wu Gang, vice president of Southeast University, said it was a practical move of the school to focus on the frontier of science and technology fields and to strengthen itself with more capability over international peers. 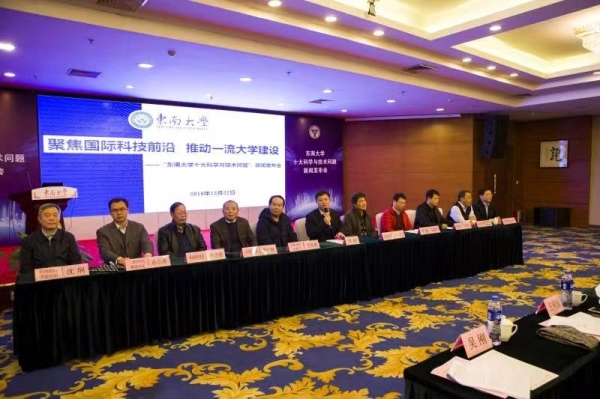 "We will provide at least 50 million yuan ($7.41 million) in three years to encourage various cutting-edge research projects among the campus," Wu said. Project leaders also shared brief introductions at the announcement. Lu Zuhong from the digital clones team said his project innovates in new drug testing as combining virtual and reality for customized application. "The technology enables us to digitally clone a patient's tumor cell, cultivate it on a chip, and then use it for new drug testing," Lu said. While discussing the initial studies of 6G mobile networks, professor and team leader You Xiaohu said that compared to 5G technologies, 6G will cover a wider range of fields with higher speed and greater security. The early research and development will mainly focus on intelligent mobile communications, massive wireless communications, millimeter wave/submillimeter wave wireless communications, optical wireless communications and broadband satellite mobile communications. "There's still a long way to go in applying 6G technologies into our daily life. Experts predict that 6G technologies will go into commercial operation by 2030. However, the 6G competition has already begun among many enterprises," You said.